When ere I peruse my collection of recordings of our wickedly wonderful Washington fiddlers, I am always pleased to run across a tune played by Jim Calvert, one of the founders of the Washington Old Time Fiddlers Association, and its president for many years. His rhythm and phrasing are always spot on and there is a lift and enthusiasm to the music that is hard to match. I was quite taken with this tune that he played, Big Foot Lou, and have been playing at it for a while now. It’s a cake walk composed in 1899 by Joseph Gearen. Once there were lyrics, but the melody is what stands out as far as us old time fiddlers are concerned, for it’s a good one. Thanks to Harold Shafer for recording this at a contest in the seventies. Cakewalks, as per Tony Caramia of the Eastman School of Music, have their roots in 1840s plantation life. The slaves would vigorously and creatively dance and strut in a parody of the plantation owners’ formal dances. Sometimes a prize was awarded the fanciest dancers. A later generation of whites in blackface then imitated the blacks in stage performances and by the 1890s black performers in whiteface were imitating the white cakewalkers. What goes around comes around. I’ve played for the contemporary community version where a circle of numbered paper plates is laid out, the dancers walk (or strut, prance or dance) around the circle until the music stops at some random place. A number is drawn and the dancer standing on the plate with that number wins a cake (or other prize) associated with that number. In an earlier version the young ladies might contribute cakes and the gentleman who won the cake also won the opportunity to share it with the baker. Cakewalks, musically speaking, are considered an early form of ragtime and often appear in such collections. A few, such as this and Eli Green’s Cakewalk, with good strong, and memorable, melodies made the leap into fiddledom. 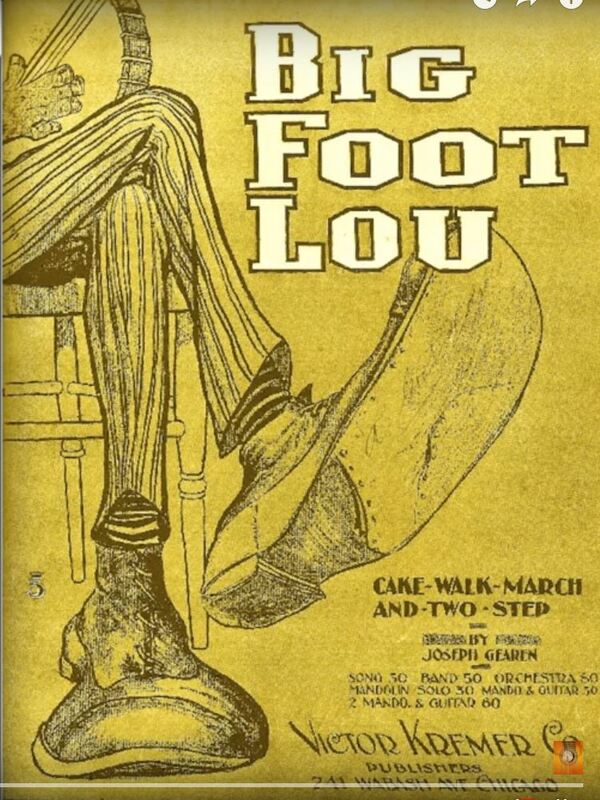 Judging by the cover of the original sheet music “Big Foot” Lou himself appears to have been a banjo player. Whether or not that he was a historical personage or a whimsical fiction remains lost in the ragtime history of more that a century ago. Big Foot Lou was published by Victor Kremer Co., Chicago, Illinois, USA. A tempo of 80 crotchets/min. is suggested.